I’ve always dreamed of living in a bright, light filled, open concept beach home, perched high on a mountainside, overlooking the water – I mean we all do, don’t we?! Recently, I received this Caleb Lantern from Pottery Barn, (if you follow on Instagram, then you know it’s from a giveaway contest I that I hosted this past week). 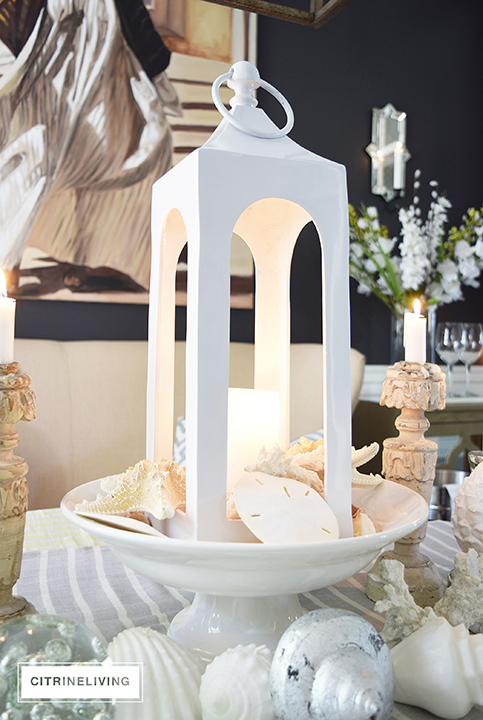 Each host had the challenge of displaying the lantern in their own setting and I wanted to create a beach inspired centerpiece for a casual gathering – one that I would host overlooking my dream beach, of course! It was important that the design evoke the feeling of that dream I had in my head, so here is what I did to achieve this look. 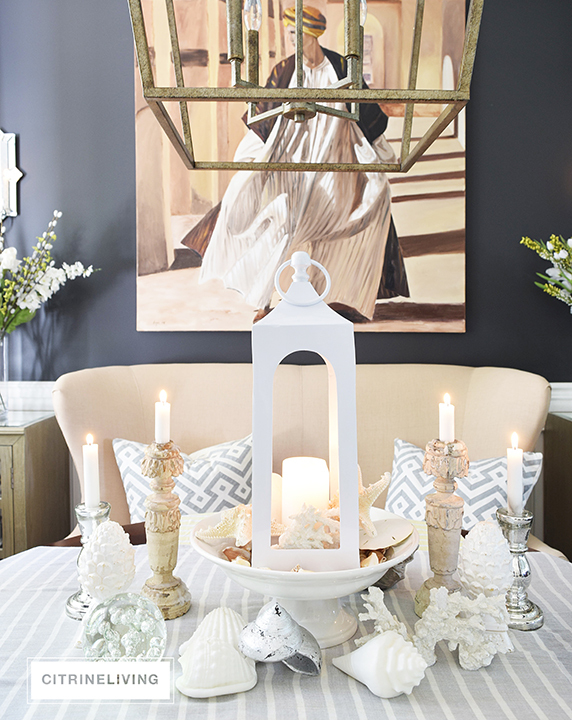 I wanted the lantern to be prominent on the table and I decided that setting it inside a footed bowl was the perfect way to showcase this modern beauty. 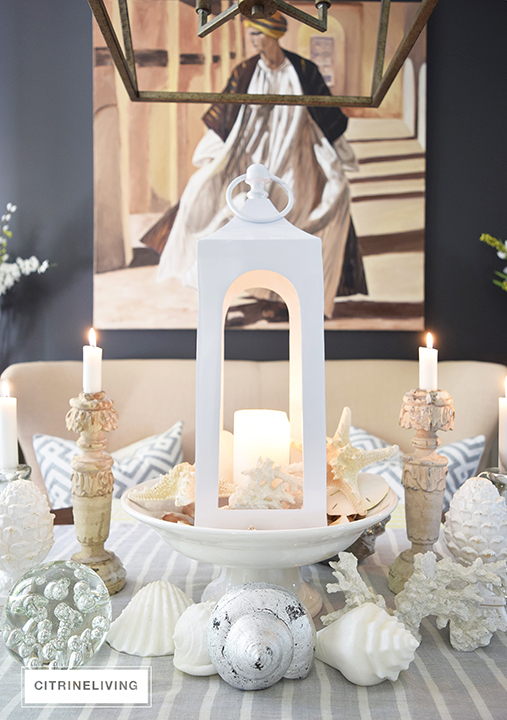 I filled the base with shells and then added the candle, coral, starfish and sand dollars. 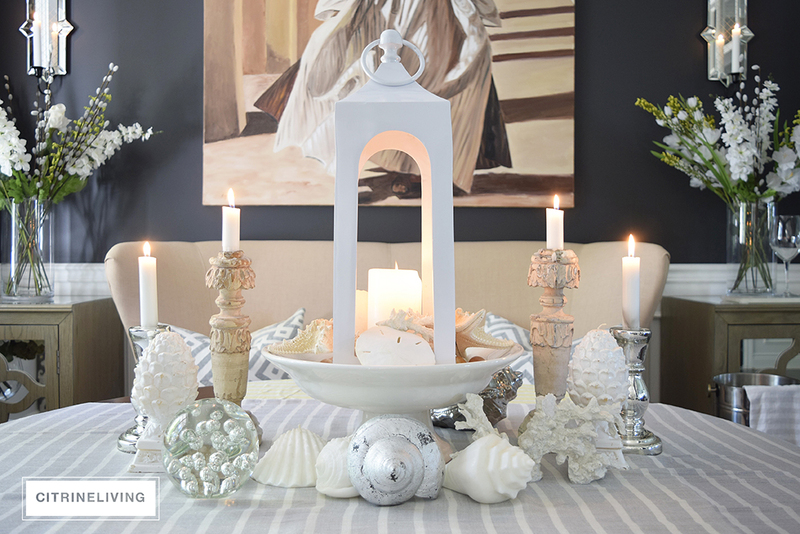 I have many coastal inspired accessories that I use throughout the year, so I gathered them together with some of my favorite candlesticks and very casually laid them on the table. I wanted to create a look of finding treasures that have been washed up on the shore. Since this is a casual summer gathering, I envisioned that the food would be simple appetizers and drinks. I imagined this table on the dock, or the sprawling deck at my dream beach house (of course! ), sprinkled with candlelight all around. 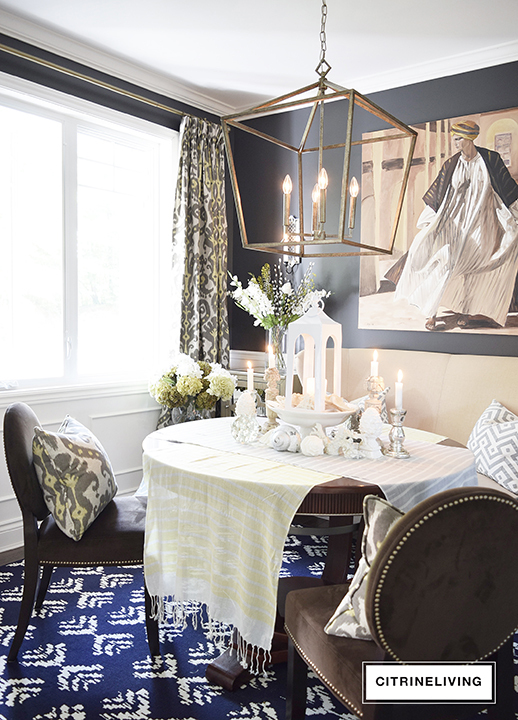 I wanted a global feel happening as well to keep the connection between the table and the design of our dining room, so I layered two striped scarves, crosswise – they’re lightweight and fringed, which to me, was the perfect base for this low-key look. I brought in my living room pillows to lighten up the look as well. The one thing I’m missing here, is the actual bottle of wine haha. No worries though, that would never happen at the party itself! You may remember seeing these mirrored wall sconces in other posts (pictured above), they were hanging on opposite wall. I’ve been looking for the right pieces to flank my mother’s painting for years – since I still haven’t, I went for these and made the switch. You know what? They’re perfect…for now anyway! 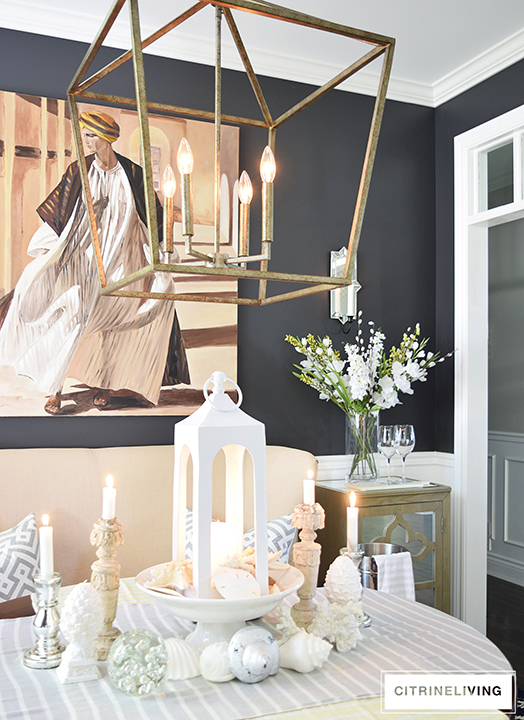 I may try to find something a little larger in scale, but they serve the purpose – adding light and reflection – to brighten up my black walls (this color is Cracked Pepper by Behr Paints). I really love how much they add to the space, they were too hidden before on the other side. 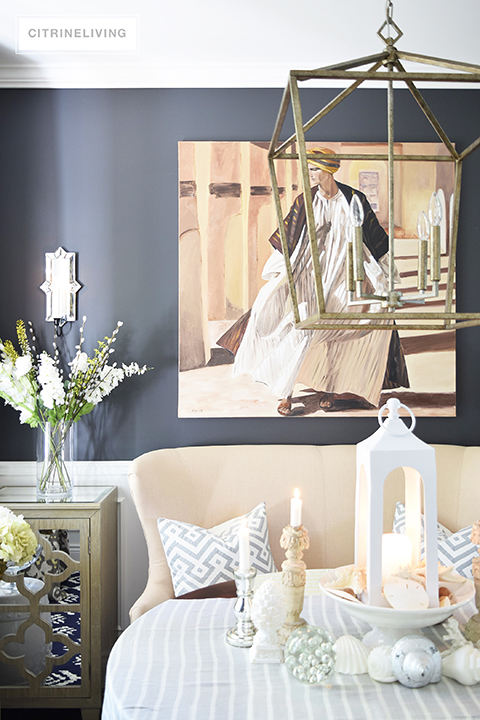 Sconces are the perfect way to add a layer to your walls and can help finish off a statement piece, like my painting. Or even tucked into a small corner that needs light. I kept my faux flowers from my Spring dining room tour, I simply split them and arranged them in my glass cylinder vases. I love how the colors pop off the black walls. You may not think you can keep the same accessories from season to season, but you absolutely can. I always try to repurpose and display things differently whenever I can. We’re still loving our new pendant light, which we installed last month. You can read all about our decision making process HERE, and why we chose this particular piece. It makes my heart skip a beat every time I see it! 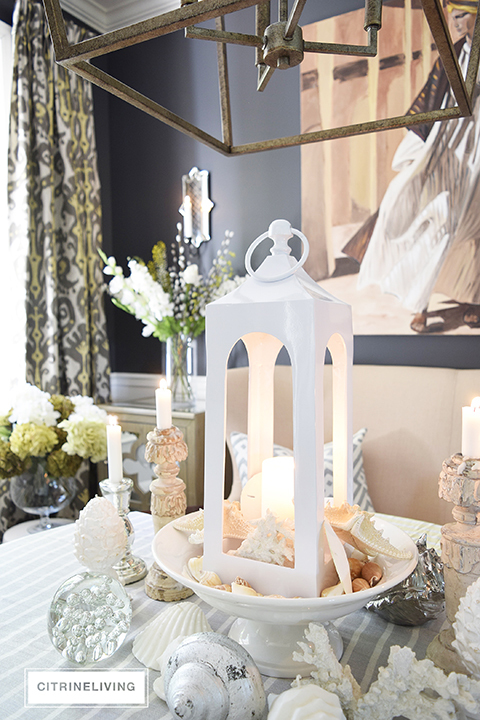 I love the glow from inside the lantern and how the candlelight emphasizes the arched openings. It’s so elegant, don’t you think? I hope you liked this table and that it’s inspired you to create a beach themed table of your own. So simple and easy to create, this would literally take minutes to do and you can never go wrong with adding natural elements. Imagine how beautiful this would be on a summer patio with a star filled sky – with wide open ocean views of course – it doesn’t get more dreamy than that! Love love love ❤️ Everything ties together…. So. pretty. Tell more about that gorgeous painting? 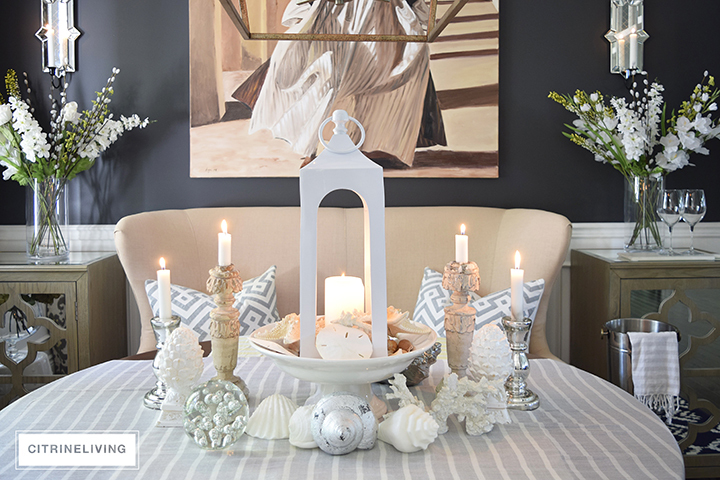 It’s perfect in as the centerpiece in your dining room. Thanks so much, Laurie!!! So happy to see you here :) This was done by my mother as an engagement gift! 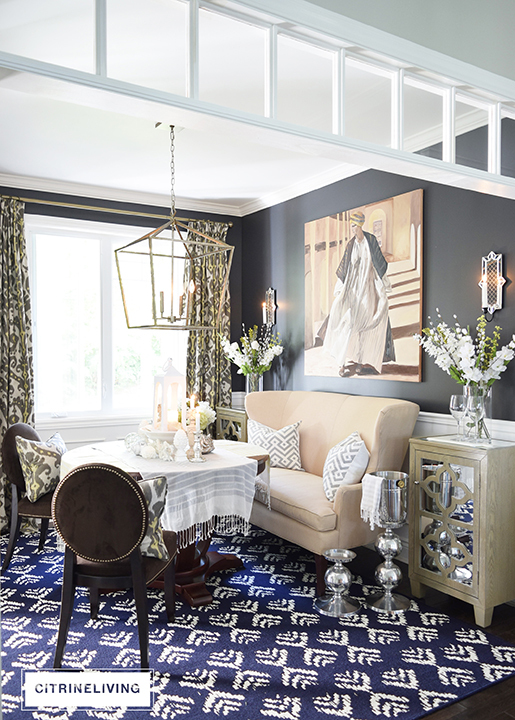 I love the sconces on the black walls and the beautiful flowers underneath..